Not sure who to vote for this year? 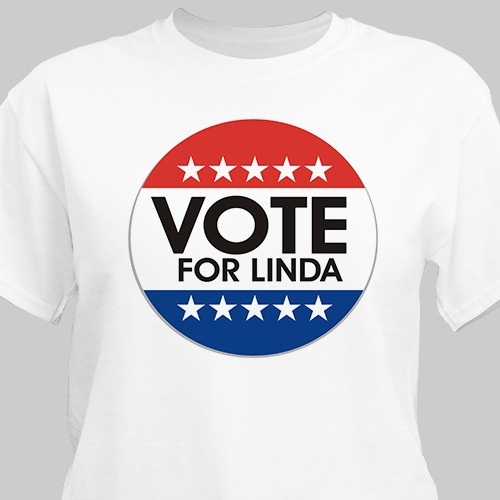 How about voting for yourself with our Voting Personalized T-Shirts. A perfect personalized gift for family & friends promoting their favorite student for Class President or for a grass roots campaign for local government. Our Vote Personalized Shirt can do it all just like your candidate. Your Custom Printed Patriotic T-Shirt is available on our premium white 100% cotton Personalized T-Shirt, machine washable in adult sizes S-3XL. Also available in Ash Gray. Includes FREE Personalization! Personalize your Vote T-Shirt with any name. GiftsForYouNow.com offers a wonderful collection of Personalized American Pride Gifts for the entire family. Create a Personalized Patriotic Gift for a special Birthday, Mother's Day, Fourth of July, Memorial Day, Veteran's Day, Anniversary or Christmas. GiftsForYouNow.com Personalized USA Gifts are personalized FAST & EASY. You will love the quality and fine craftsmanship used to make every personalized gift.